Plenty Ultra Premium Paper Towels offer a variety of uses for the kitchen, bathroom, and nearly every room in the house in a strong, durable, and absorbent multi-purpose design for your cleaning needs. Extra-scrubbing power helps you battle through the toughest of messes while face-friendly softness allows for a gentle touch to keep faces and hands clean and dry. Use them as napkins at the dinner table, too. Proven to be up to 80% more absorbent than the leading ordinary brand. Exceptional absorbency also means you can use fewer sheets and stretch the value of each roll. Tree-saving technology uses fewer trees to make great-quality, eco-conscious paper. 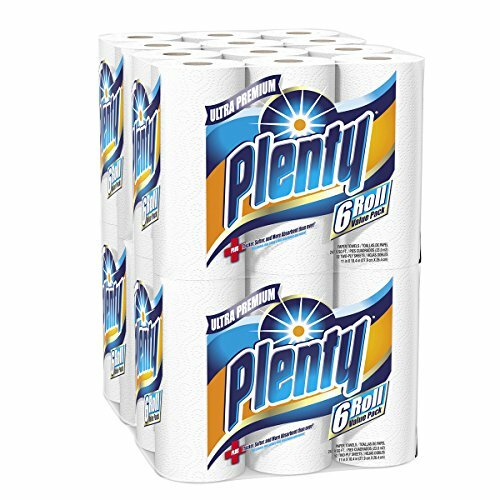 The package includes four packs of six 52-sheet paper towel rolls for a total of 24 rolls. Each six-roll pack contains 247.9 square feet; with each paper towel sheet measures 11 by 10.4 inches. Plenty Ultra Premium paper towels are manufactured in Pennsylvania and South Carolina with attention to quality, safety, sustainability and responsible sourcing practices by First Quality, a family-owned company. First Quality is a leader in developing premium quality products at a great value. In addition to our collection of paper products, we also offer lines of baby products, feminine care, adult care, and bottled water products. Plenty products come with a 100% satisfaction guarantee. Questions? Comments? Call 1-800-262-0042. Plenty Ultra Premium paper towels are manufactured in Pennsylvania and South Carolina with attention to quality, safety, sustainability and responsible sourcing practices by First Quality, a family-owned company. First Quality is a leader in developing premium quality products at a great value. In addition to our collection of paper products, we also offer lines of baby products, feminine care, adult care, and bottled water products. Plenty products come with a 100% satisfaction guarantee. Questions? Comments? Call 1-800-262-0042.